© 1997, William E. Maguire. All Rights Reserved. Anyone attending the PGA International Golf Show would beoverwhelmed with the number of trademarks and service marks on display, e.g., TITLEIST®, TAYLOR MADE®, PLANET GOLF®, ADAMS®, TIGHT LIES®, COYOTE SPORTS®, THE GOLF CHANNEL®, just to name a few. With respect to such Fairway trademarks, this article will briefly introduce the readers to the fundamental aspects of trademark law. A trademark (or mark) is defined as any word, symbol, slogan, or device (such as a design), or a combination of them, used by a manufacturer or merchant to identify his goods or services and to distinguish them from those manufactured, sold or serviced by others. TITLEIST® and LYNX® are excellent examples of 'word' marks. "#1 BALL IN GOLF" is an example of a slogan mark. An example of a service mark is THE GOLF CHANNEL® for the "production and distribution of entertainment and educational programming to cable and wireless cable television systems and wireless cable television systems featuring golf-related subject matter." Such a service mark as THE GOLF CHANNEL® can also be exploited and serve as a trademark (i.e., for clothes (shirts, hats, sweaters, vests); prerecorded videotapes; golf bags, towels, etc.). In the U.S., trademark rights are acquired through use (e.g., by selling or transporting your product in commerce with the mark attached or on a label). In addition, under certain circumstances "color" can be a trademark. 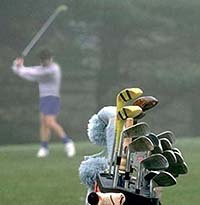 Examples outside the golfing industry are the color "pink" for fiberglass insulation and "green" for dry cleaning pads. The selection of a trademark is the first step that a merchant undertakes to create an identity for his/her golf club, balls, gloves, shoes, apparel, etc. The clearance of a trademark is the process of determining whether or not the trademark is available and is not being used by someone else as a trademark. This clearance process cannot be overemphasized in its importance. Ignoring this vital step can lead to a multitude of problems and expense. In the clearance of a trademark, a two-step process is suggested. The first step is to conduct an on-line computer trademark search of the mark. This on-line search is further clarified by identifying the goods sought to be used or sold as trademarks are categorized by classification. In the United States, the federal government has adopted the International Classification system. Toys, sporting goods, golf clubs, golf bags, and golf balls are in Class #28. Shirts and related golf apparel and clothing are in Class #25. Gear bags, fanny packs, and gym bags are in Class #18. Posters, magazines, books, trading cards, and other printed matter and publications are in Class #16. Videotapes, audiotapes, and business software are in Class #9 (including downloadable software over a global computer network). Therefore, if you are planning to sell golf clubs, apparel and videotapes, then you will want to conduct an on-line search of Classes # 28, 25 and 9. The on-line search is often called a "knock-out" search. This is because the on-line search is a quick and relatively inexpensive way to determine if the mark is already being used. These on-line searches are often available at public libraries, commercial search firms and law firms. If your mark appears free of conflicts after conducting an on-line search, the next level of search is the full search. The full search will search the federal database of trademarks at the Patent and Trademark Office, State trademark registrations, and common law sources such as phone directories and Dun & Bradstreet listings, plus internet domain names. If your mark still appears clear of conflicts after a full search, then you can be fairly certain that you can adopt and start using your mark. CAVEAT: These searches are not guarantees of the absence of conflictingmarks, but they do allow a merchant to make a more informed decision in theclearance of a trademark. To obtain maximum driver range or protection, it is best to register your trademark or service mark. In the U.S., your greatest rights can be obtained with a federal trademark registration. If you are only conducting business within one state, e.g., California, it is possible to register your mark with the California Secretary of State. However, if it is your intent to do business across state lines or in foreign commerce (or if you are already doing business across state lines or in foreigncommerce), then the prudent thing to do is to file for a federal trademark application with the U.S. Patent and Trademark Office (PTO) located in Arlington, Virginia.M" (for service marks). An application for registration of a trademark must be filed in the name of the owner of the mark. The applicant must submit: (a) a written application; (b) a drawing of the mark; (c) the required filing fee (which is $245 per mark per class at this time). The applicant will also incur attorneys fees, typically a fixed fee, should an attorney be hired to file the application(s). As previously discussed, trademarks registered with the Federal Government are categorized by a classification system which correspond to the type of goods sought to be registered. The U.S., as with many other countries, uses the International Classification (hereinafter, "Class") system. For instance, CALLAWAY®, PING® and TAYLOR MADE® golf clubs fall within Class #28; TITLEIST®, ULTRA®, and TOP FLITE® golf balls are also in Class #28; COYOTE SPORTS®, DATREK® and BURTON® golf bags are also in Class #28; THE GOLF CHANNEL® entertainment service mark falls within Class #41; ASHWORTH® and PLANET GOLF® for clothing are in Class #25; ADIDAS® and FOOTJOY® for golf shoes are also in Class #25; and GOLFWEEK® is in Class #16 for publications.M" (for service marks). After the mark is registered in the U.S., it is important to give notice of this fact by placing the registered trademark 'sweetspot' symbol, "®", adjacent to the mark. Prior to registration, it is also advisable to use the symbols, "TM" (for trademarks) and "SM" (for service marks). "Constructive Notice" nationwide of the registrant's claim to ownership of the mark. This basically eliminates the good faith defense of an infringer who claims to have lacked actual knowledge of the registered mark. Registration is also evidence of (a) the validity of the registration; (b) the registrant's ownership of the mark; and (c) the registrant's exclusive right to use the mark in commerce in connection with the goods or services. Registration also entitles the registrant to (a) file a lawsuit for infringement of the mark in Federal Court; (b) prevent importation of goods bearing an infringing mark; and (c) use the registration as a basis for registering the same mark in certain foreign countries. Trademark registrations are valid for 10 years subject to certainuse and filing requirements, and are renewable every 10 years, also subjectto continued use and renewal filing requirements. If your product is distributed internationally, then you must, by and large, register your mark(s) in each country where you plan to do business or are doing business. Is this expensive? Yes! On the other hand, the alternative is the potential loss of the ability to sell your product in those countries where a third party has filed a priorapplication for your mark(s). Therefore, foreign trademark protection is typically obtained on a country-by-country basis. Unlike the U.S., however, trademark rights in many foreign countries are obtained by registration rather than use. This further necessitates the importance of filing for marks in foreign countries as soon as possible. One notable alternative to the typical practice of registering trademarks on a county-by-country basis is the new (European) Community Trade Mark Application which will soon be available as of January 1, 1996 for the filing of applications. By obtaining a Community wide trademark registration, an owner of a U.S. registered trademark, for example, can potentially save both time and money otherwise invested in registering a mark in each separate European country and can thus hopefully attain maximum launch angle for its trademarks in overseas markets at a minimum of cost. Whether you are selling products or services and as this article suggests, it is very important to be aware of your trademark and/or service mark and their value. In a competitive business environment, the potential for economic loss is tremendous if trademark rights are not acquired, evaluated, protected and maximized. While this article does not portend to cover all the intricacies of trademark law, hopefully it has helped to shed some light on this area of the law which is of paramount importance to the business owner.